More than three weeks after taking the lead in Regular Team at the 2017 United States Bowling Congress Open Championships, Team NABR of Fairport, New York, put the final touches on an emotional journey by also securing the top spot in Team All-Events. The last pieces fell into place May 6 at the South Point Bowling Plaza in Las Vegas as Scott Pohl and Mike Rose Jr. completed their doubles and singles events, while the remaining members of the team – Adam Barta, Anthony Pepe and Brian Waliczek – waited for the news hundreds of miles away. 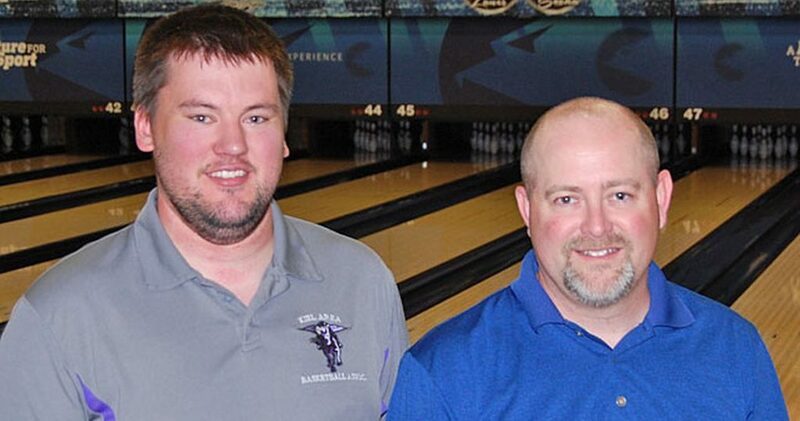 Pohl (right), who led the team effort with a 694 series, and a refocused Rose (left), who had 602 in team, returned to the Bowling Plaza to finish the job their teammates started April 14. They solidified the group’s place atop the Team All-Events standings with a 9,957 total. Vanilla Salsa of Roseville, California, previously held the lead with 9,743. Under normal circumstances, all five team members (left) would’ve been on-site to finish things together, but after a heavy-hearted surge into the team lead with a 3,266 effort April 13, Rose returned home to attend his sister’s memorial service. Shelly Rose Stein lost her battle with cancer April 12. “It’s much more relaxing now that it’s over,” Rose said of their 2017 USBC Open Championships campaign. Pohl rolled sets of 653 in singles and 644 in doubles to finish with a 1,991 all-events total, and Rose added 644 in singles and 619 in doubles for 1,865. Waliczek led the effort in April with 2,051, while Barta and Pepe added 2,040 and 2,010, respectively. 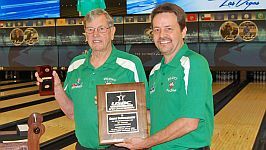 Brennan Nett (right) of Kiel, Wisconsin, found his groove during doubles and singles May 4 at the 2017 USBC Open Championships on his way to taking the lead in two Standard Division events. The 27-year-old right-hander averaged nearly 225 during his six games at the South Point Bowling Plaza to move into the lead in Standard Doubles with Douglas Turney (above right), also from Kiel, with a 1,201 total, and Nett’s overall effort helped him take over the top spot in Standard All-Events with 1,865. 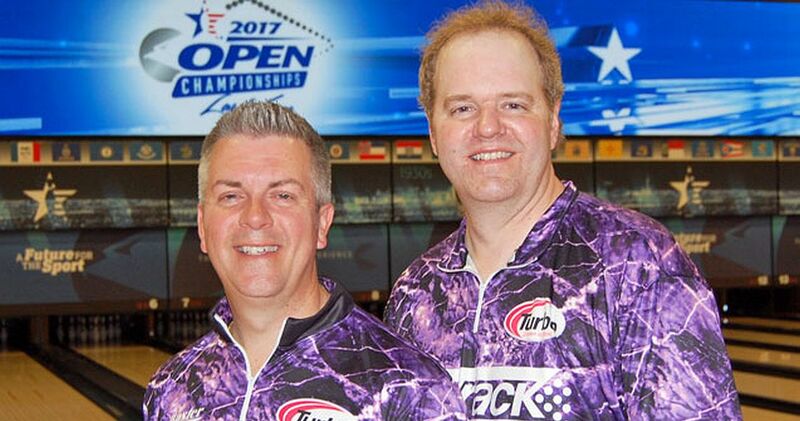 Thomas Fredrick and Mark Mallow (left, l-r) of Watertown, Wisconsin, previously held the Standard Doubles lead with 1,192, while Stephanie Sanders of Bakersfield, California, led Standard All-Events with 1,826. After starting his third Open Championships appearance with a 516 effort in team May 3, Nett settled in with games of 213, 226 and 245 in doubles for a 684 set. Turney added 517. The 245 game for Nett included strikes on his final eight deliveries. Nett recorded seven consecutive strikes during his first game of singles to start with 259, and he added 190 and 216 to finish with a 665 total, which is fifth in Standard Singles. Charlie Theobald of Minot, North Dakota, leads with 696. Standard Doubles includes bowlers with combined entering averages of 361-419. Standard Singles and All-Events includes bowlers with entering averages of 181-209. 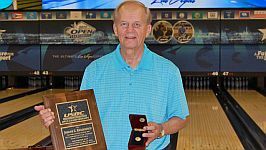 Four bowlers joined the 50-Year Club this week at the 2017 USBC Open Championships. 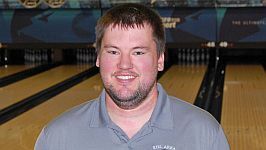 Edwin Macha of Decorah, Iowa, made his appearance May 2, while Gerrit DeMeulenaere of Macomb, Michigan, and Joe Krajkovich of North Brunswick, New Jersey, hit the lanes May 4. Patrick Risner of Dansville, Michigan, celebrated his milestone appearance May 8. 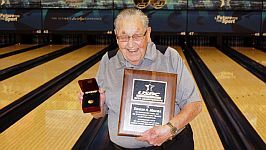 Each bowler received a plaque, chevron and diamond lapel pin on the lanes at the South Point Bowling Plaza to commemorate the achievement. Macha (left), 85, has made the trip to the tournament each year since his debut at the 1968 event in Cincinnati. The Clark County (Ohio) USBC Hall of Famer only bowled team event in his 50th consecutive appearance, rolling a 332 series to bring his career pinfall to 70,716, a 167.9 lifetime average. DeMeulenaere (right), 77, was joined on the championship lanes in Las Vegas by his son and grandsons, making his milestone appearance an easy favorite. DeMeulenaere began his tournament career at the 1967 event in Miami. This year, he added sets of 533 in singles, 521 in doubles and 400 in team for a 1,454 all-events total. He has knocked down 80,975 pins for an average of 182.3. Krajkovich (left), 74, also started his tournament career at the 1968 Open Championships, and a second-place finish in Regular Team at the 1972 event in Long Beach, California, is as vivid in his memory today as it was when his Raritan Oil team nearly ran down the leading score. The New Jersey State, Middlesex County and Somerset County Hall of Famer rolled sets of 560 in doubles, 534 in singles and 529 in team for a 1,623 all-events total to bring his career pinfall to 86,228, a 192.9 lifetime average. Risner, 81, competed in team and doubles this year, rolling sets of 383 and 375, respectively, for a 758 total. In 50 tournament appearances, he has knocked down 76,337 pins for a 170 average. 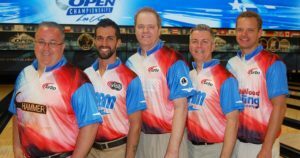 The 2017 Open Championships kicked off Feb. 18 with 23 bowlers scheduled to celebrate 50 years of participation. Two bowlers from the Keystone State are scheduled to celebrate five decades on the championship lanes this week at the South Point Bowling Plaza. 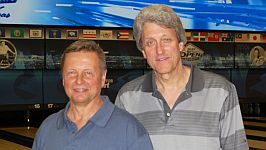 USBC Hall of Famer and two-time USBC Open Championships titlist Gary Bower of Camp Hill, Pennsylvania, will make his milestone appearance May 13, and Harry McCoy of Ambridge, Pennsylvania, is scheduled for his 50th appearance May 15. Richard Van Rossem of Canton, Illinois (May 12), George Barnes of Clarence, New York (May 15) and Bill Hohensee of Lexington, Kentucky (May 16), each will be celebrating 55 years of participation this week in Las Vegas. 1, Team NABR (Adam Barta, Anthony Pepe, Mike Rose Jr., Scott Pohl, Brian Waliczek), Fairport, N.Y., 3,266. 2, HoF Silver Lanes 1, New Hartford, Conn., 3,239. 3, Kruse’s Pro Shop, Fargo, N.D., 3,198. 4, TJ’s Pro Shop, Beaver Dam, Wis., 3,191. 5, Supreme Deck, Grand Haven, Mich., 3,174. 6, ND Storm, Glenburn, N.D., 3,161. 7(tie), Chet’s Crew 1, Arlington, Texas, and The Lakers 1, Brooklyn Park, Minn., 3,160. 9, Classic Lanes Raisins, Milwaukee, 3,158. 10, Hindel Pro Shop, Indianapolis, and SIR 1, Tafton, Pa., 3,148. 1, Ryan Zagar, Racine, Wis./Tylor Greene, Davison, Mich., 1,409. 2, Charles Richey, Concord, N.C./Steve Arehart, Chesapeake, Va., 1,385. 3, Scott Erickson, Waunakee, Wis./Chris Gibbons, Madison, Wis., 1,378. 4, Michael Kubacki Sr., Griffith, Ind./Sammy Krucek, Hammond, Ind., 1,369. 5(tie), Jonathan Schalow, Evansville, Wis./Chad Svendsen, Monroe, Wis., Chris Hans, Battleboro, N.C./Kyle Troup, Taylorsville, N.C., and Doug Hayes, Clarksville, Tenn./Jimmy Cook II, Indianapolis, 1,365. 8, David Labinski, South Milwaukee, Wis./Steven Brinkman, Sussex, Wis., 1,362. 9, Francois Lavoie, Wichita, Kan./Dan MacLelland, Grand Rapids, Mich., 1,345. 10(tie), Darin Craine, Flint, Mich./Robert Leser, Fenton, Mich., James Ring, Madison, Wis./Ross Strand, Centennial, Colo., and Trevor Yonan, Sheboygan, Wis./Rob Warren, Antigo, Wis., 1,342. 1(tie), Matt Gasn, Clarksville, Tenn., and Steve De Kerf Jr., Sheboygan Falls, Wis., 802. 3, Adam Barta, Girard, Ohio, 776. 4, Austin Gratzer, University Place, Wash., 773. 5(tie), Sam Sylvester, Hugo, Minn., and Todd Lathrop, Colchester, Conn., 770. 7, Chris Curry, Indianapolis, 769. 8, Tony Buck, Rockford, Mich., 768. 9, Curt Aemisegger, Schaumburg, Ill., 759. 10, Rick Knickerbocker, Sacramento, Calif., 758. 1, Jacob Boresch, Kenosha, Wis., 2,122. 2, Todd Lathrop, Colchester, Conn., 2,105. 3, Chris Gibbons, Madison, Wis., 2,102. 4, Stu Williams, Phoenix, 2,090. 5, Shawn Naumann, Orlando, Fla., 2,053. 6, Brian Waliczek, Frankenmuth, Mich., 2,051, 7, Dave Beres, Greenfield, Wis., 2,048. 8, Ryne Greenwood, Kenosha, Wis., 2,045. 9, Adam Barta, Girard, Ohio, 2,040. 10, Sammy Krucek, Hammond, Ind., 2,035. 1, Team NABR (Adam Barta, Anthony Pepe, Scott Pohl, Michael Rose Jr., Brian Waliczek), Fairport, N.Y., 9,957. 2, Vanilla Salsa, Roseville, Calif., 9,743. 3, Buddiesproshop.com No. 2, Naugatuck, Conn., 9,638. 4, Lakeview Lanes, Baldwinsville, N.Y., 9,635. 5, High5Gear, Wichita, Kan., 9,596. 6, Every Kiss Begins with Kruml, O’Fallon, Mo., 9,588. 7, Ogle 5, Louisville, Ky., 9,461. 8, SIR 1, Tafton, Pa., 9,447. 9, Cundiff’s Pro Shop, Appleton, Wis., 9,423. 10, Stars & Leafs, Grand Rapids, Mich., 9,393. 1, Minnesota Select Sires 1 (Arvid Strande, Carl Krause, Paul Buendiger, Scott Molnar, Andrew Kasten), Fergus, Minn., 2,922. 2, Chris’ Boys, Livingston, Mont., 2,778. 3, General Distributors 2, Beavercreek, Ore. 2,748. 4, Scotty’s 3, Alexandria, Minn., 2,738. 5(tie), Aztec 4, Lacey, Wash., and Invazn, Columbia, Mo., 2,729. 7, Rimmy’s Pro Shop 2, Oak Lawn, Ill., 2,709. 8, Ten Pins Pro Crew 3, Fremont, Calif., 2,697. 9, Becker’s Pro Shop, Muskego, Wis., 2,696. 10, Wildcat Lanes 1, Wayne, Neb., 2,688. 1, Douglas Turney/Brennan Nett, Kiel, Wis., 1,201. 2, Steven Costa, Chicago/Anthony Giannecchini, Hawthorn Woods, Ill., 1,197. 3, Thomas Fredrick/Mark Mallow, Watertown, Wis., 1,192. 4, Ramon Pagan/Raymond Haran, Chicago, 1,191. 5, Nicholas Frederick, Commerce, Mich./Zane Hollander, Las Vegas, 1,190. 6, Danny Smart, Shreveport, La./Jim Daubenheyer, Valparaiso, Ind., 1,188. 7, Debra Barmore, Omaha, Neb./Tim Kightlinger, West Des Moines, Iowa, 1,187. 8, Cody Maier/James Medina, Spring Creek, Nev., 1,180. 9, Michael Barber, Winnemucca, Nev./Benjamin Wells, Old Hickory, Tenn., 1,177. 10, Todd Montgomery/Robert Denison, Woodland, Calif., 1,176. 1, Charlie Theobald, Minot, N.D., 696. 2, Nolen Fisher, Caldwell, Idaho, 677. 3, Larry Neb, Loveland, Col., 674. 4, Earl Bowe, Freeport, Bahamas, 667. 5, Brennan Nett, Kiel, Wis., 665. 6, Jonathon Berg, Bismarck, N.D., 663. 7, Fred Phillips, Richland, Wash., 658. 8, Don Thompson, Rio Rancho, N.M., 652. 9, John Dowell, Portland, Ore., 651. 10, Edmond Dair, Missouri City, Texas, 650. 1, Brennan Nett, Kiel, Wis., 1,865. 2, Nolen Fisher, Caldwell, Idaho, 1,829. 3, Stephanie Sanders, Bakersfield, Calif., 1,826. 4, Timothy Hagar, Celina, Ohio, 1,809. 5, Mike Thielen, Eagle Grove, Iowa, 1,801. 6(tie), David Miller, Menomonie, Wis., and Stanley Chambliss, Opelousas, La., 1,795. 8, Paul Chelminiak, Oconomowoc, Wis., 1,784. 9, Clarence Wallace, Freeport, Ill., 1,783. 10(tie), Donald Van Dine, Orlando, Fla., and Tyler Bryant, Canon City, Colo., 1,778. 1, Scotty’s 8 (Chad Brandt, Ryan Dew, Bruce Corneliusen, Zach Hedine, Alan Iverson), Alexandria, Minn., 2,569. 2, Dusty’s Floor Covering, Twin Valley, Minn., 2,487. 3, Spray and Pray, Los Angeles, 2,486. 4, Brant Construction, Spirit Lake, Iowa, 2,462. 5, Kutztown Fire 1, Kutztown, Pa., 2,456. 6, Decorah Auto Center, Calmar, Iowa, 2,437. 7, Wags N Whiskers, Livingston, Mont., 2,436. 8, Crooked Creek 1 Bar & Grill, Bowman, N.D., 2,413. 9, Pat’s Dairy Whip, Princeville, Ill., 2,405. 10, 4Skinniesn1Bear, San Gabriel, Calif., 2,401. 1(tie), Aaron Hagen/Brody Hagen, Benson, Minn., and Mark Nelson, Clitherall, Minn./Lynn Good, Battle Lake, Minn., 1,102. 3, Cari Wiest/Larry Wald, Wishek, N.D., 1,091. 4, Dalton/Jessica Mortenson, Moorhead, Minn., 1,083. 5(tie), Fannie Patterson, Clymer, N.D./Sarah Plecker, Hummelstown, Pa., and Leilani Basinger/Jonathan Greer, Riverside, Calif., 1,069. 7, Cameron Simmonds, DeGraff, Minn./Allen Jackson, Belle Plaine, Minn., 1,064. 8, Carol Fuller/Jason Ingram, Sioux City, Iowa, 1,060. 9(tie), Charles Lindeman, Belt, Mont./John Lindeman, Fort Benton, Mont., Sheldon Smith, Timber, Mont./Nick Stenberg, Big Timber, Mont., William Lampe, Gaithersburg, Md./Stephen Peterson, Rockville, Md., Willie Harrell, Hamilton, Ohio/Arthur Thomas, Cincinnati and Jerry Ammann, Aldie, Va./Levent Ozusta, Annandale, Va., 1,058. 1, Nick Stenberg, Big Timber, Mont., 621. 2, Michael Tengan, Hilo, Hawaii, 607. 3, Gary Pettway, Sweetwater, Tenn., 598. 4, Rory Hanlon, Las Vegas, 592. 5, Efrain Rodriguez, New York, N.Y., 590. 6, James Lee, North Platte, Neb., 589. 7(tie), Gregory Lancaster, Port Orchard, Wash., and Tonja Lindbo, Bremerton, Wash., 587. 9, Cody Maier, Spring Creek, Nev., 584. 10, Jonathan Eickhoff, Lowell, Mich., 583. 1, Nick Stenberg, Big Timber, Mont., 1,733. 2, Gary Pettway, Sweetwater, Tenn., 1,704. 3, Cody Maier, Spring Creek, Nev., 1,686. 4, Phuoc Tran, West Covina, Calif., 1,661. 5, Tina Wetzel, Elk Grove, Calif., 1,646. 6, Joel Willis, LaPlata, Md., 1,640. 7, Efrain Rodriguez, New York, N.Y., 1,636. 8, Tyler Hagen, Stayton, Ore., 1,633. 9, Nicole Kleutgen, Plainfield, Wis., 1,632. 10, Justin Snow, White Lake, Mich., 1,629.